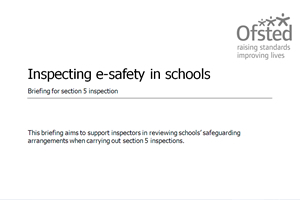 As the Easter break began for many schools across the UK, Ofsted released their latest version of the 'Inspecting e-safety in schools' briefing document. In the main, the inspection criteria remained unchanged - the only exception being an amendment to the key features of good and outstanding practice for management of personal data. There is, however, now more information about the reason why e-safety is such an important issue to face in schools, notably the change in device ownership demonstrating the decline in mobile phones amongst young people, in favour of tablet devices. This could be indicative of how young people are using technology - while school work remains the top online activity for UK youth, they are also playing games, viewing TV shows and films, downloading music and, of course, interacting on social media sites. Figures quoted in the report recognise the rise in usage of social media sites among young people, with the transition between primary and secondary education apparently being a trigger. 28% of young people have a Facebook account as they leave primary school, but this rises to 59% for 11-12 year olds. Further data provides evidence that parents are now more likely to talk to their children about online activity. 83% of parents trust their children to use the internet safely. The subject of online personalised advertising is raised for the first time in this edition, with 42% of 12-15 year olds stating that they were not aware that websites could use their information in that way. A definition of this will be added to the E-safety Support Knowledge Base. As ever, at E-safety Support, we will review the resources available from our website against the latest Ofsted briefing and will update the material as necessary. Members will be advised about updated resources via the Members Dashboard.